Here’s what you can expect from read performance using the Linux CIFS kernel module prior to kernel 3.2. 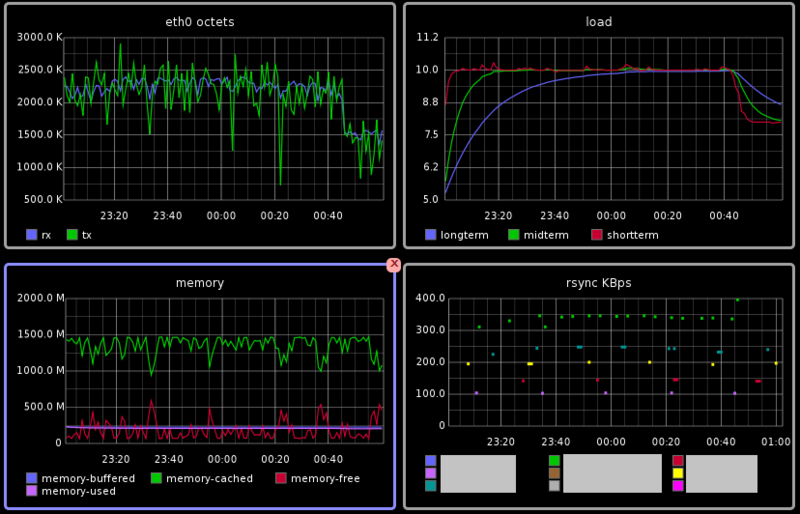 See the ‘rsync’ graph in the lower right. Each of the colors in the rsync graph represent remote WAN sites. Each data point represents a transfer of ~200MB. 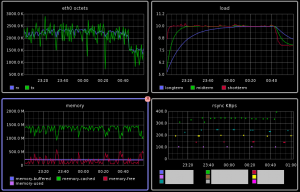 Performance did not improve when using cp in place of rsync, nor did it improve with tweaks to the rsync options. The client of the CIFS shares was 96% CPU idle. A textbook case for illustrating to novices the reduced value of looking at load averages (see graph) to indicate how hard a host is working. The CPU graph was removed as it was irrelevant. Thankfully, this is a largely solved issue and we’ll see it in future distributions. Here is the thread from the linux-cifs list. Discipline is important in any job. In my experience, discipline is the most frequently missing ingredient in the field of web operations. I believe this to be caused by a lack of focus, laziness, that it is a job instead of an art. Also awesome: Career Development presentation by Theo. We got sick of yum hanging on corrupt RPM databases.